Extremely powerful and very rare, this traditional Protector Knot has been blessed by the Dharma Protector of Kechara during trance in the monastery. As trances are very rare even in the monasteries, so are the items blessed by the Protector. 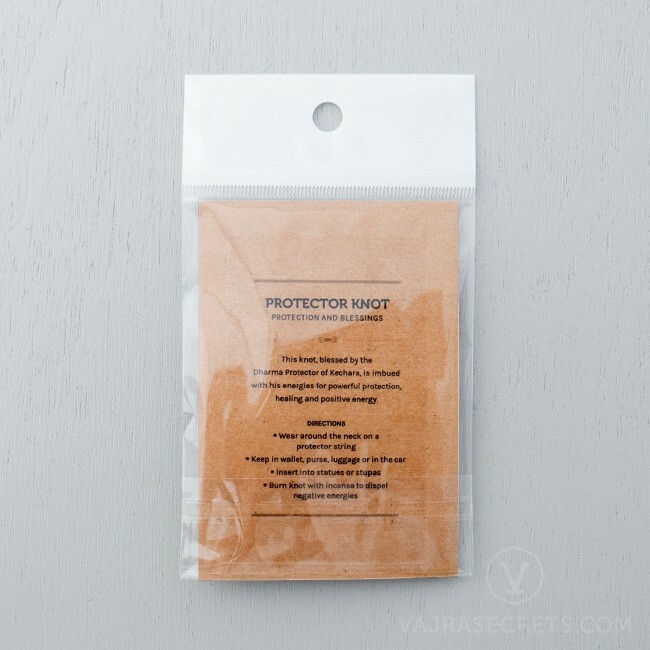 Our protector knot is highly sought after as it contains the Dharma Protector’s energies and presence. As such, it has a wide variety of uses including for protection, healing, and positive energy. This traditional handmade protector knot has been blessed by the Dharma Protector of Kechara during trance in the monastery. As trances are very rare even in the monasteries, so are the items blessed by the Protector. 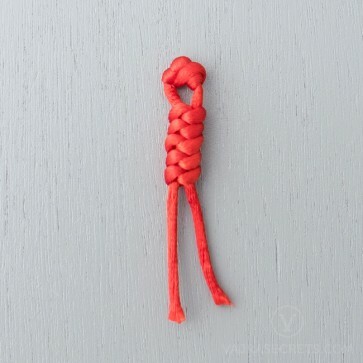 Our protector knot is highly sought after as it is imbued with the Dharma Protector’s energies. The intricate knots are handcrafted according to Tibetan tradition and symbolise his presence. As such, it has a wide variety of uses including for protection, healing, and positive energy. The protector knot is commonly worn around the neck (usually on a protector string) or kept in one's bag, purse or in the car, for a continuous supply of positive energy and protection from harm. It can also be used to relieve spiritual disturbances or to dispel negative energies in an area, especially when the knot is burned with protector incense and the smoke allowed to permeate the premises. For a safe journey, the protector knot should be worn and can also be placed in luggage to help prevent untoward incidents. It can also be placed on the head of a dying person to help the person pass on peacefully. This holy knot can also be placed in statues and stupas for additional blessings and protection. I do not leave anything to chance and the protector knot is my safety net. I urge everyone to get protection. Don't ever think you can do it all on earth by yourself. I almost got killed three times over the years, by reckless drivers and I came out alive. Years back I got the Protector's pendant and I have it with me at all times. I JUST GO SOFT WHEN sHRI sETRAP IS BROUGHT TO MIND - DESPITE HIS FIERCE COUNTENANCE, I SOMEHOW SENSE BENEVOLENCE; sHRI SETRAP EVOKES A SENSE OF TRUST, BECAUSE I TRUST THAT BENEVOLENT YET POWERFUL BLESSING GROUNDED ON ENLIGHTENED WISDOM OF aMITABHA BUDDHA! aND NOW, ALL THAT MANIFESTING IN THE BEAUTIFUL BLESSING KNOT! aAAUUW! WONDERFUL! iT'S EASY TO CARRY THIS SPIRITUAL 'POWERBANK' AROUND - NOTHING CHUNKY, 'KLINKY' OR HEAVY. OH, IT'S SO AESTHETICALLY ARTY TOO! OTHERS WHO SEE IT WOULD BE PROMPTED TO PRAISE IT THEN. GOOD CONNECTION FOR THEM!